To be a plant in my house is the equivalent of being on death row. Therefore I look at gardening books with a mix of envy and wonder. Most books are filled with how-to tips and lots of glossy pics. This book is quite different. 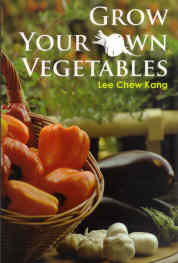 The author is an agriculturist, and he has several audiences in mind for this book: people who want to grow their own veggies, and students and teachers at universities and colleges. So the tone is rather academic, and there's lots of info about the ways commercial farms are managed. It has a practical, textbook type of look. The bits I found interesting were the pictures of pests, the discussion about growing pesticide free crops, and the sections on how to use your own urine to help crops along. It's very much aimed at the local market, so if you are a keen gardener, or want to be, then this one is worth a look. The book sounds interesting, I wonder if it can do something with my no so green thumb? I would like to grow veggies in the garden, I was able to grow basil one time but unfortunately it died later. I grow lots of herbs and some veggies but maybe I could skip the part about urine pest control. I've grown vegetables before and it is not that hard if you have the right conditions (we do not have enough sunlight where we live now.) A book like this one that gives advice for a specific region is really helpful. Bugs and urine.... MMm-mmm! Just what I am looking for in a book! Seriously, though, most of my attempts to grow fruits and vegetables have failed. I normally harvest them once, and then that's it. They never humour me with a second harvest. I end up spending more on fertilisers and garlic pest spray than I would have just buying my organic veggies from Giant Bowl.